Victor Guerin, a French archaeologist who searched for the “great spring” of Herodotus, was the first person who discovered the first 400m of the aqueduct, from the Agiades spring, in 1853 under the auspices of the ruler of Samos Georgios Konemenos. However, it was the monk Kyrillos Moninas, in 1882, from the nearby Agia Triada monastery who persuaded the ruler of Samos Kostakis Adosidis to undertake an investigation campaign and succedded to discover the south and north entrances of the main tunnel (Kienast 1995). During 1882, the first attempts to clean and restore the water channel to working order were abandoned due to the great difficulties arising. The water was brought to ‘Tigani’ (Pythagoreion previous name) through an external, surface conduit. A small building was erected on the southern entrance of the tunnel, still on site. 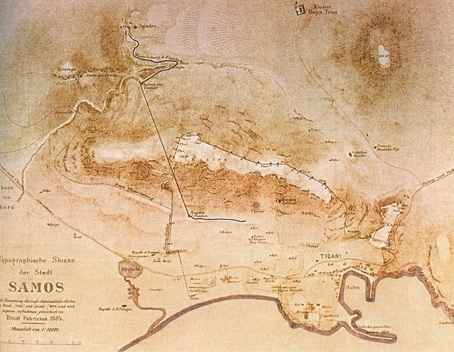 In 1884, E. Fabricius, an archaeologist of the German Archaeological Institute in Athens (DAI), visited the island and surveyed the tunnel up to the point that could be visited at the time. He published a systematic description and a sketch on an British Admiralty Map, rendering the aqueduct known to researchers and the wide public. In 1884, the archaeologist E. Stamatiadis published the article «Περί του εν Σάμω ορύγματος του Ευπαλίνου», commenting on the discovery (see below). Topographical measurements was taken almost 75 years later by W. Kastenbein, however in 1971 U. Jantzen (1909-2000), Director of the DAI, succeeded after long preparations to excavate and research the tunnel (1971-1973). After that H. Kienast undertook the laborious project of documentation and publication, concluded 20 years later. The site was opened to the public in the 1980’s. Stamatiadis E. (arcaeologist) "Περί του εν Σάμω ορύγματος του Ευπαλίνου» (1884).